Utilizing proprietary surface technologies, SRT-10 and SRT-10C SEC phases are made of uniform, hydrophilic, and neutral nanometer thick films chemically bonded on high purity and mechanically stabilized 10 µm silica. The well-controlled surface chemistry results in excellent lot-to-lot reproducibility. Our unique bonding chemistry, coupled with the maximized bonding density, allows SRT-10 and SRT-10C SEC phases to provide high stability and negligible non-specific interactions. SRT-10 and SRT-10C packings have large pore volume, resulting in high separation resolution. The narrowly dispersed, spherical silica particles of the SRT-10 SEC-100, 300, 500 and 1000 have nominal pore sizes at 100 Å, 300 Å, 500 Å and 1000 Å, respectively. 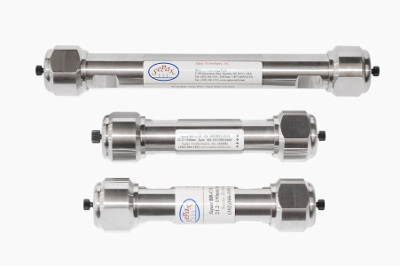 Typical applications for SRT-10 and SRT-10C columns include separation and detection of biological molecules and water-soluble polymers in aqueous buffers. Various types of non-hydrophobic protein including MAb and etc. ADC, Derivatized MAb, Pegylated Protein, Membrane Protein, "Super sticky protein", and etc. * FPLC is a trademark of GE Healthcare.